Search across points ‣ Each city gets indexed with a lat/lon pair ‣ Search for the next point to the supplied one ‣ Problem: Neighbours! Enter GraalVM! ‣ AOT static compilation + SubstrateVM = executable binaries of java apps ‣ Using SubstrateVM ‣ Reflection! Discussion … ask all the things! View Running a Serverless Lucene Reverse Geocoder on Notist. 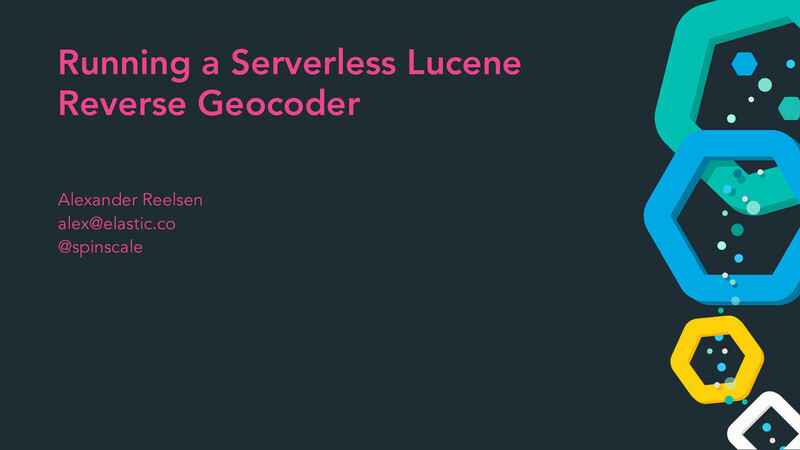 This presentation talks about the possibility of running a reverse geocoder based on lucene in a serverless environment. The talk features the serverless framework, lucene geo capabilities using points and shapes, and last but not least mentions graalvm to reduce start up times. Alexander puts presentations on for free. You can too.